Property owners must first create a login account to view or pay taxes for the properties they currently own. Setting up your account for the first time is easy and quick. Step by step instructions are below. After setting up your user account using the following instructions you will also be able to pay taxes online by using the tax search. Tax Payments - see following instructions. City Staff are not familiar with the technical aspects of the property search software and cannot walk citizens through the system over the phone. If you need additional help after following the provided instructions, please call BS&A Software directly at 1-855-272-7638 and they will gladly help you with your access question. The link to the property search website is at the bottom of this page. Complete the next form and submit. Check your email and click the link in your email. Login using your new User and Password. How to search and link your property to your user name. 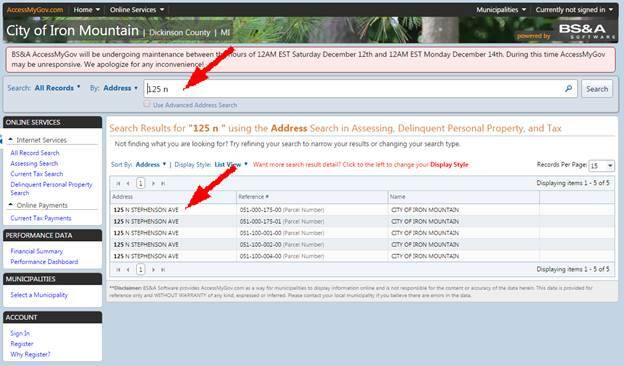 After you login, use the search bar to find the address you are looking for and click on your property. Simplest way is to type only the number portion of address and choose from the resulting list. 2. Click the ACCESS THIS RECORD FOR FREE box. Your login is now linked to your property. Next time you visit the site and enter your User and Password you will have free access to your property. Please note: The owner name we have listed in our database must appear identical on each property you own. If you have multiple properties that appear under different combinations of names, spouses names, middle initials, or spellings you will need to create a User and Password for each variation of owner name and complete the process of linking to the property with each new login name. Login using your User and Password if you have not already. 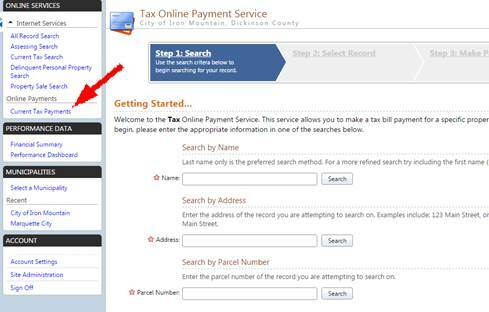 You switch between property and tax information using the tabs part way down the page. The green “JUMP TO” box will allow you to navigate to the different information sections on that page. Clicking the plus or minus icons next to sections will show or hide more details. You can either make a payment from the TAX TAB or by clicking on the menu item in the left column. 2. Follow the instructions on the website. Payments will include a service fee. The service fee is charged by the company that processes the payments on behalf of the City. 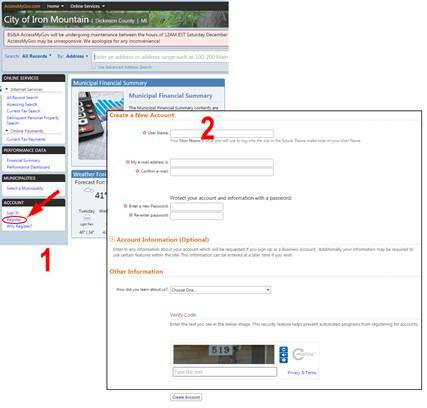 As of the time of these instructions the fee is 3% for credit cards or $3.00 for checking accounts. Please note that City Staff are not familiar with the technical aspects of the property and tax website and cannot walk payers through the process over the phone. The website is maintained and supported by BS&A Software. If you are having problems using the website please call the software company directly and they will be happy to assist you. For questions or help please call BS&A Software at 1-855-272-7638. You will need a separate login for each business name you list properties under. You must logout of any other user login first (upper right of screen). Search for your rental property. Repeat the steps above to create a new user account and link it to a property with your business name. If you have properties under multiple rental business names repeat the process for each group of properties, creating a different user login for each group. Please note: The name we have listed in our database must appear identical on each property. Please contact the City Assessor’s office if each of your property names are not identical. You cannot ADD properties under other names to your existing user login. The user login will automatically work on your other properties as long as our records here have all of them with the same exact spelling of owner name. If you ever “get lost” on the BS&A site you can always get back to the Iron Mountain search page by typing "www.cityoforinmountain.com/propertysearch" in your browser's address bar. If the owner name you look up differs in the slightest to the first property in your login setup, it will ask you to pay for the record. For questions or help with using the lookup, creating an account, or access problems please contact the software company directly. City Staff are not familiar with the technical aspects of this property search software, please call BS&A Software at 1-855-272-7638 and they will gladly help you with your access question.